Accuity LLP is one of the largest and most experienced professional services firms in the state of Hawaii. Its predecessor firm was the Hawaii outpost of PricewaterhouseCoopers, lending an impressive Big Four pedigree to its name. On the other hand, Accuity’s management and culture were rooted in local values, setting it apart from large mainland corporations. 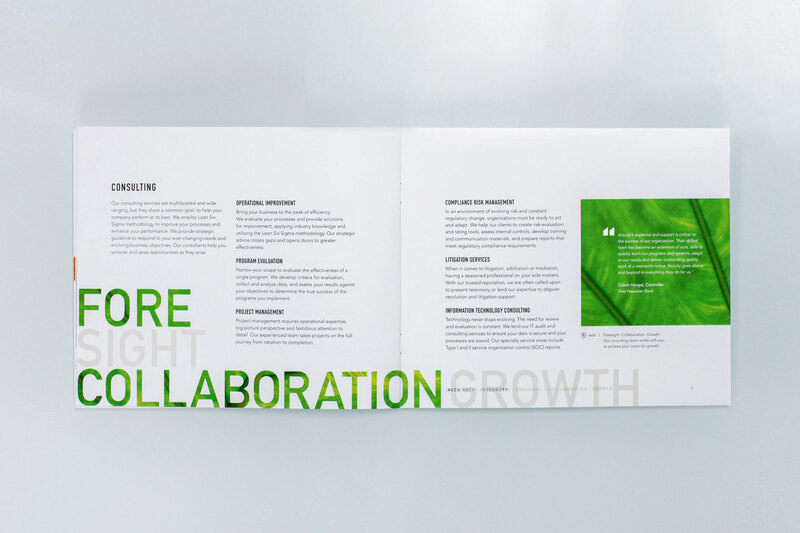 Accuity needed a more modern brand aesthetic to stand out from the crowd. 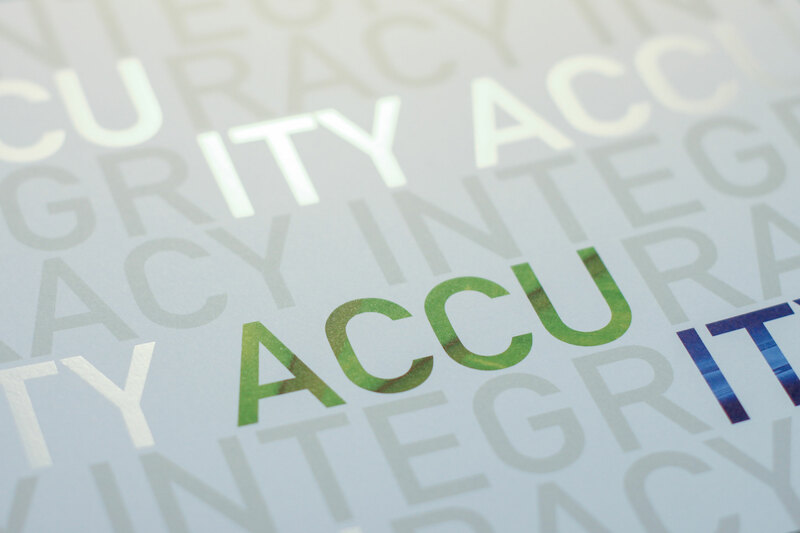 An emphasis on Accuity’s values and leading-edge expertise would differentiate the firm from local and mainland competitors. We have a solid reputation built on our experience, our values and the quality of our work. Now’s the time to build a strong visual identity that reflects our modern, innovative approach and sets us apart from our competitors. 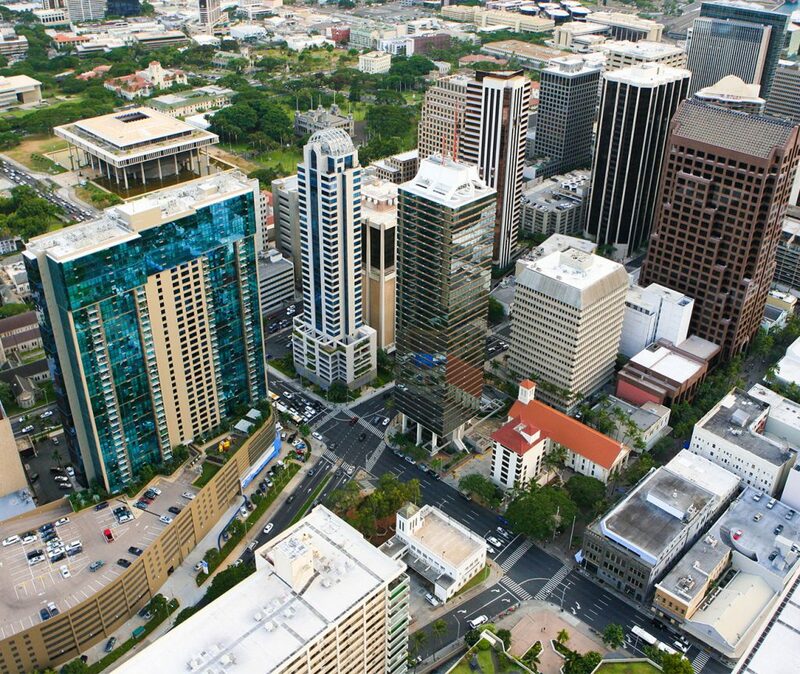 Accuity provides professional services to some of the most influential companies in Honolulu. 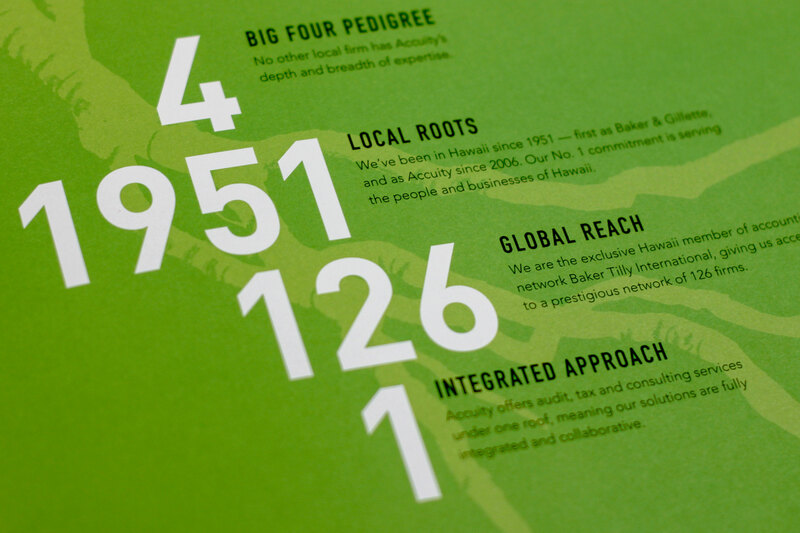 Each of Accuity’s service areas was paired with a Hawaiian element symbolizing traits such as adaptability, guidance and growth. The bold, natural elements provided a pop of color and energy, vastly different from the cold, inanimate imagery often employed by professional services forms. The bold cover played on the words “accuracy” and “integrity,” which together form the Accuity name. Throughout the piece, the name Accuity was broken down into a mathematical formula highlighting the root words of accuracy and integrity. The treatment of Accuity’s name drove home the firm’s defining characteristics: quality work and quality people.